Here’s another ben 10 game featuring one of the strongest alien – Ben 10 Cannonbolt Crash. The evil clowns of Zombozo have attacked and you must use the powers of Cannonbolt to get rid of them! Make sure you dispatch all of them back to where they came from! As the name suggests, Ben 10 Cannonbolt Crash game is about crashing the powerful Cannonbolt into the evil clowns and see them dead in one smash! The game starts as the Zombozo sends it’s evil clowns to spread the chaos all over the place. Then, Ben 10 takes up the challenge to wipe them off and bring things back to normal. Recommended: Play Ben 10 Cannonbolt Pinball game online for free now! And for that Ben uses omnitrix to turn into Cannonbolt and do what’s needed! But, before you get ready to enter the ben 10 cannonbolt crash game, take a look what going to happen in it. Just like most of the ben 10 games, this one is also a level-based game featuring 15 different challenges to play. As the game begins cannonbolt faces a number of evil clowns in standing in different attacking positions. All you have to do is to direct and throw the Cannonbolt in such a way it hits the maximum number of clowns. All the clowns you hit will die. As the game proceeds and the difficulty of the levels increase. In further level, there will be obstacles, moving clowns and much more to take the game to another level. But if you got your skills right, you will definitely win! Pro Tip: Use the obstacles with springs to bounce back at higher speeds! Remember, the lesser moves you take to kill all the clowns, the more stars you will earn. So, use your brain to make sure you kill more clowns in less moves. So, that’s all you need to know about this exciting ben 10 game, now its your time to do the action. Use the powers of Cannonbolt and dispatch all the evil clowns back to where they came from! 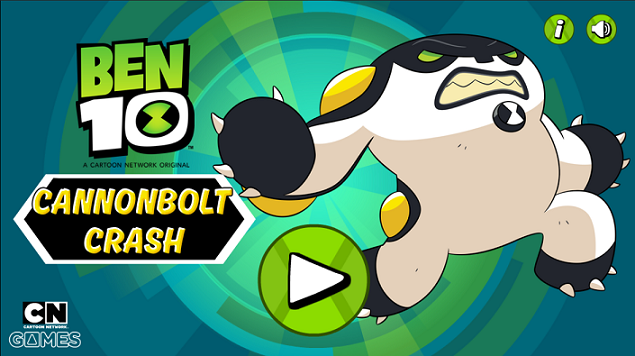 Don’t Forget to give your rating for Ben 10 Cannonbolt crash game and share your tips and tricks to win this game in the comments section below.